The last four days brought MJE on an epic journey from Gush Etzion, to Hebron, and back to Jerusalem for an amazing Shabbat. In Gush, we stood inside a bunker where the last fighters bravely stood before being massacred in the battle of Kfar Etzion during the War of Independence. As we passed the Mekor Chaim Yeshiva, we shared a moment of silence to remember the three Israeli teenagers kidnapped and killed last summer by Palestinian terrorists (2 of whom were students at this Yeshiva). During lunch at a vineyard, we heard from my dear friend Rabbi Ari Berman who spoke on the unexpectedly high level of happiness found in Israeli society. In Hebron we brought snacks to a military base and visited with the young heroes of the IDF who serve in this most difficult area. We prayed at Ma’arat Ha’machpala (Tomb of the Patriarchs/Matriarchs), one of the holiest places in Judaism. We ended the day by singing and dancing to the songs of our people in a Kumsitz hosted by the gracious Cohen couple back in Jerusalem. The next day we met with my Rebbe and teacher, Rabbi Avigdor Nebensal (former Chief Rabbi of the Jewish Quarter), arguably the most pious and scholarly person alive today and soaked up his simple yet profound answers to our complex questions. We later welcomed in the Sabbath overlooking the Kotel (Western Wall) and heard a fascinating talk from teacher and author, Rabbi David Aaron about the function of “time” in our lives and in Judaism. On Shabbat, we reveled in the peace of Jerusalem and a hard earned day of pause and rest. On our last day, we toured the religious neighborhoods of Old Jerusalem with Rabbi Benjy Levine, grandson of the Tzadik of Jerusalem, Reb Aryeh Levin. He delighted us with tales of growing up with his famed grandfather – the colorful characters and poignant stories that are the legacy of his family. We brought toiletries and other basic necessities to the Michael Levin Lone Soldier Base where we honored the memory of the lone soldiers (soldiers from outside of Israel who serve in the IDF) who gave their lives fighting for the State of Israel, and met some of the brave young men and women who serve under the lone soldier status today. Finally, we had lunch with David Sprung – a veteran of the Six Day War who shared with us what it was like to be among the first few soldiers to liberate Jerusalem. Needless to say, the last leg of this trip was packed with learning, emotion and meaning. There are so many things I could say about these last few days, but there is one thought, one simple but beautiful idea, that came up over and over again in every program and with every speaker: the Jewish people as a family. Rabbi Ari Berman asked us “Why do you think Israelis are so happy despite the constant stress they are under?”. He explained that this happiness results from a sense of freedom and uninhibited self expression that can only come from the comfort of living amongst “family.” Israelis, he argued, despite their many differences and problems, consider each other “mispacha” (family). He shared with us a series of hilarious and touching “only in Israel” stories that illustrate just how deeply this family connection runs. Rabbi Ari’s many stories sparked a discussion amongst the group, and the rest of the day participants excitedly shared their similar experiences. One participant shared a story from her time living in Tel Aviv. It was her first time in Israel for Yom Kippur and she did not realize how early everything shuts down. When in a cab on her way back to the city late afternoon, erev Yom Kippur, her driver asked if she was prepared for the holiday – did she have groceries to prepare a meal before and after the fast, because nothing would be open… She did not. Her driver took her to the one store in all of Tel Aviv that was still open. The line was of course around the corner. He turned the meter off and waited for her while she did her last minute shopping, then brought her home, free of charge. I shared with the group my own story, from a trip to Israel with my wife Jill and our newborn Yosef, many years ago. We were shopping in the very religious part of Jerusalem, in the section of Meah Shearim, when Yosef started crying – he was hungry. I ducked into the closest shop, a small dusty Jewish bookstore and asked the owner if he knew of a place my wife could nurse. In Hebrew the Chasid sitting behind the counter asked me: “she needs this now”? Hearing our son wailing at the top of his lungs I smiled and answered: “Yes!”. He said there was nowhere else to go and immediately started asking the customers looking around his store to leave. He then handed me a large ring of keys and showed me how to lock the door of the store after he too would leave. Before he did so he pulled up a chair for Jill and poured her a glass of water and said: “it’s clean” and then left the store. I locked him out his store and after about 15 minutes we were finished and I let him back in. By that time I had I had a number of items sitting on his counter which I was going to purchase from him as a way of saying thanks but he wouldn’t allow it. This Chasid said that he had just performed a “chesed” for a fellow Jew and if that chesed were to remain pure and holy he could not receive anything in return. I picked up a pair of Tzitzit and said: “but I need a pair anyway!” He proceeded to show me another store where they sell such items. I left the store with nothing other than the extraordinary love of a fellow Jew. “It’s not for you to finish the task, but you are not free to cease from trying”. Judaism teaches that though we might never be be able to accomplish all that the Torah wishes us to do, each of us must do our part and never give up trying to do more. When we met with the soldiers in Hebron and the lone soldiers in Jerusalem, we were reminded of this all important teaching – for each of us to do our part. At the same age most American teens are heading off to college to study and party, Israelis and volunteers from abroad are putting on a uniform to protect the land and people of Israel. When the Israeli soldiers in Hebron greeted our group, they called us brothers and sisters. They were so grateful for our visit and explained that our support abroad means the world to them. I was so struck by the humility with which they serve, as if it is no skin off their backs. I told them they are not just fighting for their country, their service in the IDF protects their whole family – and that includes us Jews living in the diaspora. Because of them, we live safer and can carry ourselves with pride in New York. We tried to thank them, but they kept thanking us back. To them, they weren’t doing anything out of the ordinary. They were doing what any decent son or daughter would do for his/her parents and family. A Lone Soldier explains his motivations for joining the IDF. A plaque for Mikey Levin can be seen in the background. We are far from a perfect family. We argue and are unnecessarily divisive. Just a few weeks ago on Tisha B’av we recounted how the second Temple was destroyed because of Sinat Chinam or baseless hatred between Jews. Every family has its differences. Every family fights. But as Rabbi Benjy Levine reminded us, echoing the spirit of his saintly grandfather, these differences must be worked out with respect, tolerance and love. What do you do when your mother insults you, or your son disrespects you? How do you rise above, be the bigger person, and work things out from a place of love and respect? There are of course many strategies for dealing with family turmoil, but when it comes to the family of Israel I think the best antidote to tension and intolerance is Jewish pride. Jewish pride can ultimately remind us that we are but one family with one heart. How did you get on this trip? I was determined to go to Israel this year. It was actually one of the resolutions I had made with myself for the new year. For the past 8 or 9 years it has been a huge desire for me to visit Israel, connect with my people, my culture and my history. It was so important for me to go on this journey, but more importantly to go with the right people. People that shared my interests, a group I felt I could also learn from. 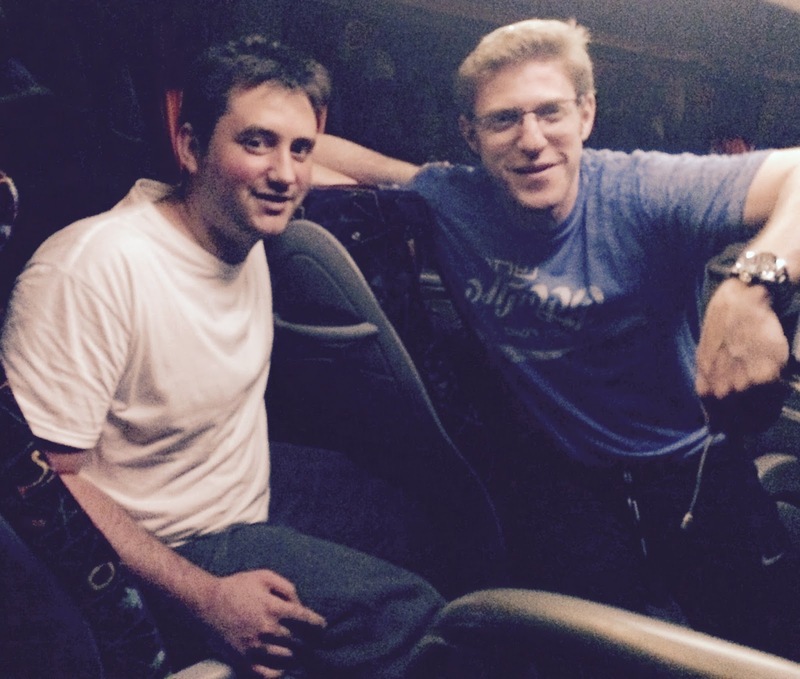 I was familiar with Manhattan Jewish Experience (MJE) and attended a few events years ago, but decided to reconnect when I heard about an Israeli heritage trip. I met with Rabbi Jonathon Feldman and decided to attend his weekly classes/talks. I found these sessions to be very insightful and really enjoyed and looked forward to these “Tuesday Talks”. I own a pair of juggling sticks!